Even when the days are at their shortest, you can see the ghosts of summer…the skeletons of perennial grasses and wind-swept vines… still poking through the snow. 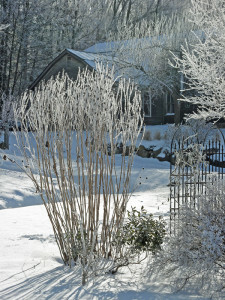 And, if you are not too fastidious, these ‘ghosts of summer’ can become a big part of your winter garden pictures too. We all know, of course, about the routine of ‘putting the garden to bed’. For eons this has been a seasonal rite of fall; by mid November all proper gardeners are supposed to have cut every last herbaceous plant to the ground and consigned its stalks to the compost pile. 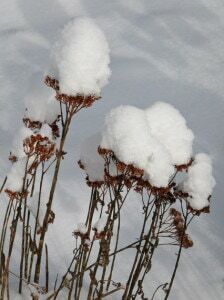 But, with this compulsiveness, we deny ourselves the pleasure of seeing these same stalks and seed-heads, either dramatically silhouetted against the snow or part of a snow-less winter picture. So next fall, experiment with leaving your more robust perennials in place until spring. You will probably find that many of them not only remain upright through even the worst weather, but that they also really look attractive in the wintery landscape. And, as an added bonus, their seeds are an excellent source of food for the chickadees, goldfinch and other birds that keep us company through the coldest months. 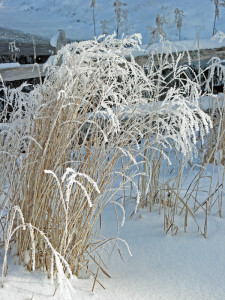 In winters where there is little or no snow, almost all ornamental grasses will look great. But with continuous or heavy snow, grasses with delicate stems, such as Purple Moor Grass, Molinia arundinacea ‘Skyracer’ will eventually collapse. 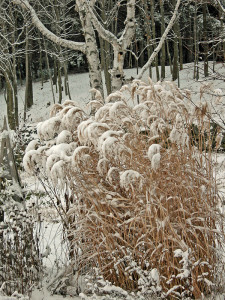 For standing up to winter weather of all kinds, the prize for the best all-rounder goes to Miscanthus chinensis ‘Malepartus’. Its feathery seed-heads catch and hold the snow, and its seven foot stems are still standing, ram-rod straight, in early May when I start my spring clean-up. However, it is important to remember that in places enjoying warmer winters coupled with long summers, some Miscanthus have been found to spread by seed, making them potentially invasive. Where this is a problem they should NEVER be allowed to go to seed! I am also very fond of Panicum ‘Dallas Blues‘ which offers a more airy texture. 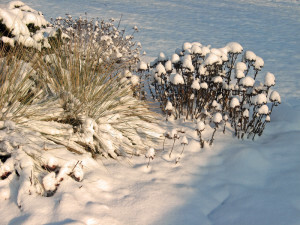 This switch grass resists the snow better than some of the other Panicum cultivars (such as the colorful Panicum ‘Shenandoah’), but will eventually succumb. I have already mentioned Blue Oat Grass (Helictotrichon sempervirens) for its winter resilience. It is just one of a number of shorter grasses and sedges that, after being inundated by snow, emerge almost completely unscathed as the snow recedes. Indeed, they can withstand multiple cycles of the snow coming and going. Others in this category which I grow in my garden include Carex flacca, Festuca glauca, and Deschampsia flexuosa. For a more interesting effect, I like to combine shorter grasses or sedges with something creates a contrasting texture. In the picture above I have Blue Oat Grass is growing alongside with a pair of dwarf evergreens, a Horsford’s white pine (Pinus strobus ‘Horsford’) in the front and a False cypress (Chapaecyparis ‘Boulevard sport’)in the rear. 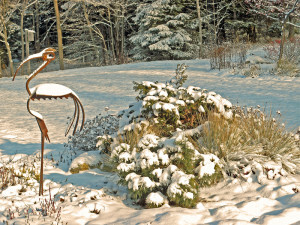 Many of the best perennials for the winter garden are some of the tried-and-true stalwarts that thrive in cooler climates. Most gardeners are aware of how Sedum ‘Autumn Joy’ looks in its winter dress. Its flat-topped flower heads and sturdy stems stay straight and upright even in the foulest weather. 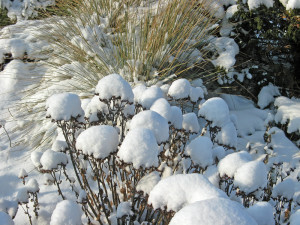 Then, it just takes a fresh fall of snow to deck each one out in a tidy white cap. But there are plenty of other perennials that I like to leave for winter, starting with several varieties of Rudbeckia. Perhaps the most dramatic is the six-foot tall Rudbeckia nitida ‘Herbstronne’. It has amazingly strong stems topped with black conical seedheads. I am particularly fond of the late-flowering Chrysanthemum rubellum ‘Mary Stoker’, with straw colored flowers that are great as companions for the low growing fall Aster ‘Purple Dome’. As a ‘garden mum’ it is reliably hardy here in Zone 4 (there are not many of those), and it is probably the last perennial to flower in my garden each fall. 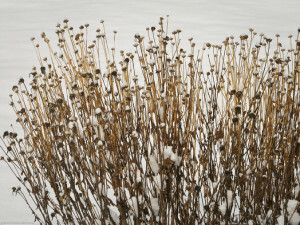 It is also to be a great winter keeper, with its flaxen-colored stems (reminiscent of its past-gone flowers) and the speckled look of its seedheads. By contrast its earlier-flowering counterpart, Chrysanthemum ‘Clara Curtis’, although perfectly hardy, has no winter stamina at all and is definitely a candidate for the fall compost pile. Which to keep and which to toss? And ‘Clara Curtis’ is not alone in this respect. The stems of some perennials tend to break down quickly, and if left standing through the winter, may contribute to disease carry-over. And certainly they will do nothing to grace your winter views. But there are plenty of others whose stems break down more slowly and which are definitely worth keeping until spring.